Savouring (or savoring) means to luxuriate, relish, appreciate, and delight in something. It’s a great word because it also implies a sensual pleasure or thrill, as well as a joyous cherishing. The “Grim Reaper”, pictured above, is a 4 lb. (1.8 kg) beef burger, 1 lb. 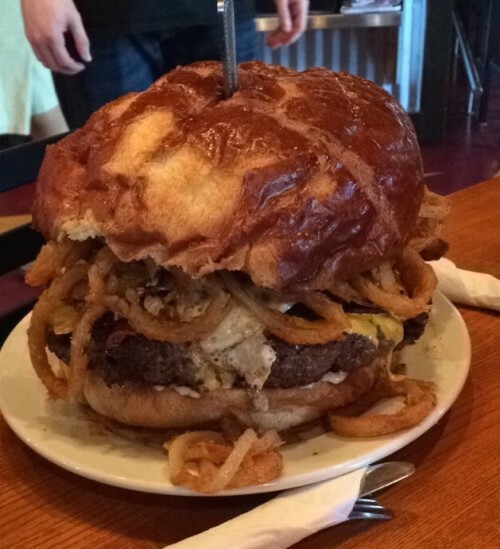 (454 g) of bacon, 6 fried eggs, onion rings with chili cheese tater tots on a giant bun. Eating the “Grim Reaper” burger would not be about savouring or cherishing and you’d feel violently ill afterwards. Think about those times when we’ve been outside doing a vigorous activity all day. Then when we finally eat, and are truly hungry, food tastes so much more delicious and satisfying. One bite of chocolate is heavenly, however an entire cheesecake is sickening. In our culture, we have so much abundance that we tend to eat when we’re not really hungry. It’s never as satisfying. The same goes for children having too many toys. When they have too much, they don’t know what to do with it all. It becomes overwhelming and they don’t even use all of their toys, or know how to tidy up. They don’t learn to treat things with respect. It’s not just kids either. When adults have too much stuff, the same results occur; overwhelm, mess, disrespect, and dissatisfaction. Having less allows us to appreciate more. Savouring everything starts with reducing our exposure to it, as in the old adage, “Absence makes the heart grow fonder.” Minimalism is your heart growing fonder every single day.